It's time for Inspiration Week at Little Miss Muffet Stamps and this week I'm keeping it simple with one of my favorite images, Polka Dot Pals Soleil, who is making the ASL sign for 'love'. 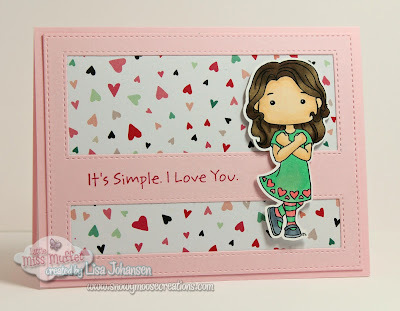 I love this horizontal cover up die, it makes it so easy to create fast and simple cards. For this card I picked out the heart patterned paper from my sash, secured it to the pink frame and then adhered that to the pink card base. The sentiment was stamped in SU Rose Red to match some of the hearts on the paper and then I used my copic markers to color in the image with colors also pulled from the patterned paper. I did pop the image up for added dimension. Super quick card with a sweet message, you can't beat that! Don't forget, the Anything Goes Challenge is still happening over at the Little Miss Muffet Stamps blog so make sure you head on over there and play along with us! 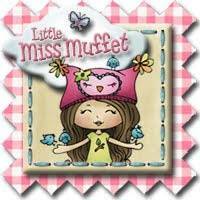 Also, stop by the Little Miss Muffet Stamps store and check out all the new images HERE.